The Mount Rachel Christmas Star has been a community tradition since 1935. 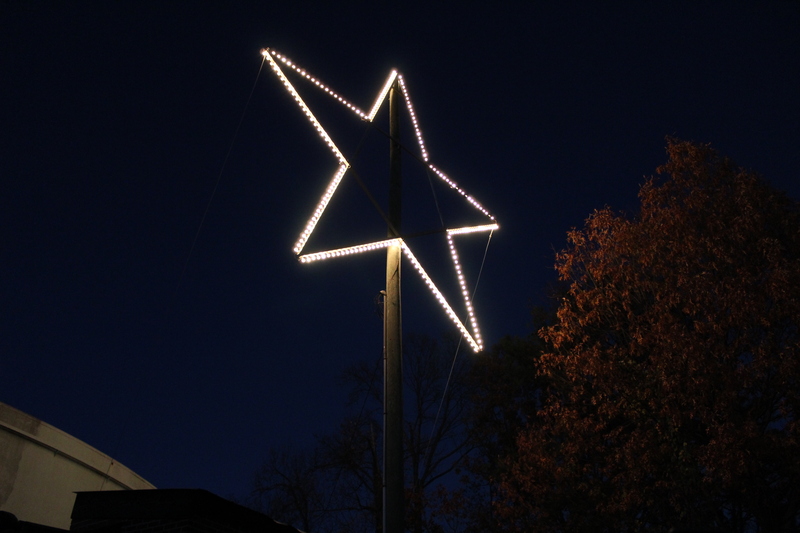 The star, owned and maintained by Dalton Utilities, shines brightly in the night sky from December 1st each year through New Year’s Day. Built in 1935 by the late Carl McCamy, former superintendent of Dalton Utilities, the original structure was a 30-foot tall wooden frame with 150 light bulbs attached to a pole. The temporary structure was placed on top of Mt. Rachel each December. The star was lit every year after 1935, except during the blackouts in World War II. In 1947, V.D. Parrott, Jr., former Dalton Utilities’ president, and the Board of Water, Light and Sinking Fund Commissioners replaced the original wooden star with a permanent structure made of iron. The star was completely overhauled in 2005 when Dalton Utilities’ personnel rebuilt the frame, replaced all the lights and rewired the structure. The Mount Rachel Star measures 40 feet in diameter and towers 65 feet above the mountain. Over 230 bulbs give the star its glow, which can be seen several miles away. All of the star’s bulbs are LED, so it can shine even brighter for the Christmas season! Each year, the star is switched on by a descendant of Carl McCamy or children of Utility employees/retirees. Mount Rachel was named after the wife of John Hamilton, a wealthy landowner, who built the Hamilton House located near the mountain on Chattanooga Avenue. Built in 1840, the Hamilton House is the oldest brick home in Dalton and predates the city. Widowed at 42, Rachel was left to manage the large working plantation and raise seven children. During the Civil War, Rachel found asylum in middle Georgia. After Gen. Sherman’s army passed, Rachel returned to Dalton to find her home being used as a hospital. She continued using her home as a hospital and nursed wounded soldiers from both armies. Five of her sons fought for the Confederacy. She lived at the house on Chattanooga Avenue until her death in 1876. The house was sold to Crown Cotton Mills in 1884. The Hamilton House is now owned and maintained by the Whitfield-Murray Historical Society and is listed on the National Register of Historic Places.